How would you feel if you had a monster under your bed? Scared? Excited? In I Need My Monster, a young boy finds that he just cannot sleep without his favorite under-the-bed monster. When the oozing, shaggy beast goes on a vacation, he tries to find an equally fearsome replacement. In I Need My Monster, a young boy holds an audition to find a substitute for his favorite monster after he leaves on a fishing trip. 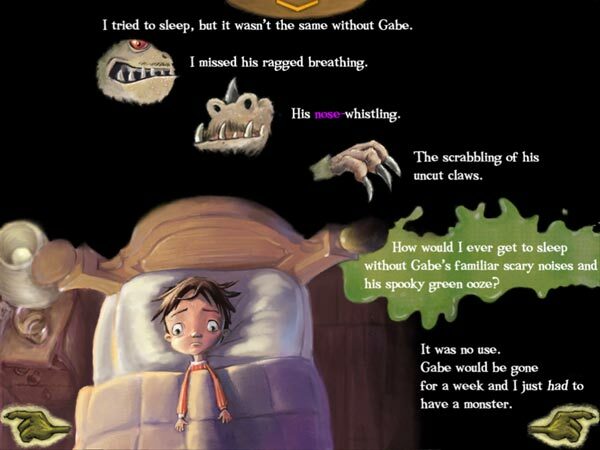 I Need My Monster is an interactive digital adaption of a children's storybook authored by Amanda Noll and illustrated by Howard McWilliam. In this darkly humorous tale, we follow a young boy -- called Ethan in the original book, but left nameless in the app for you to personalize -- who checks under his bed one night only to discover that the monster who is usually there, Gabe, has gone on a week-long fishing trip! While most people would be happy to be rid of a terrifying beast, it is not the case with our young narrator. A scary monster with sharp claws, ragged breathing and a spiky tail is what he needs to keep him bound to his bed at night. Considering his options, the lad knocks on the floorboards to request for a replacement monster. With a creaking sound, one substitute monster after another appears before Ethan. Much to his dismay, however, they just do not live up to his expectations. The first monster has no claws, while the second is too well-groomed. The third is terrifying, but she is a girl ("Boy monsters are for boys and girl monsters are for girls. Everybody knows that." the boy insists). The fourth monster arrives with a stumpy tail and unusually long tongue. The boy giggles; why would anyone be afraid of a long tongue? So he dismisses the last monster, who tells him not to expect another replacement that night. As the boy worries if he is going to be able to sleep, he is surprised by a creaking sound under his bed. It is Gabe, who returns early from his trip because he finds that the fish scare too easily. Happy to learn that his favorite monster is back, the young boy declares, "No other can scare me like you!" and dives under the covers. He falls asleep in no time. Unfortunately, no monster is like your own. 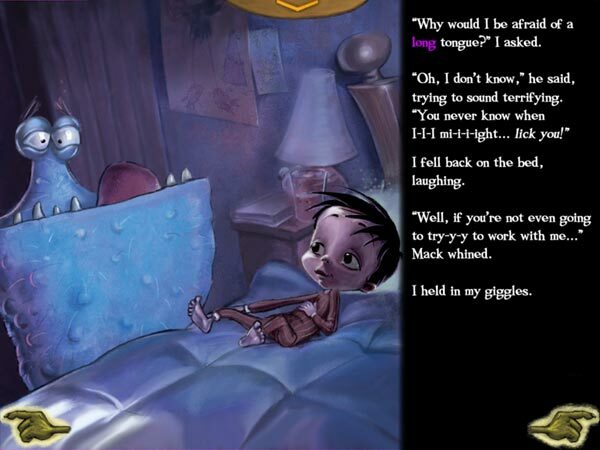 I Need My Monster is an interactive storybook that explores the fantastic and often absurd imagination of juniors. Despite its ominous title and theme, it is actually only mildly scary and mostly amusing. 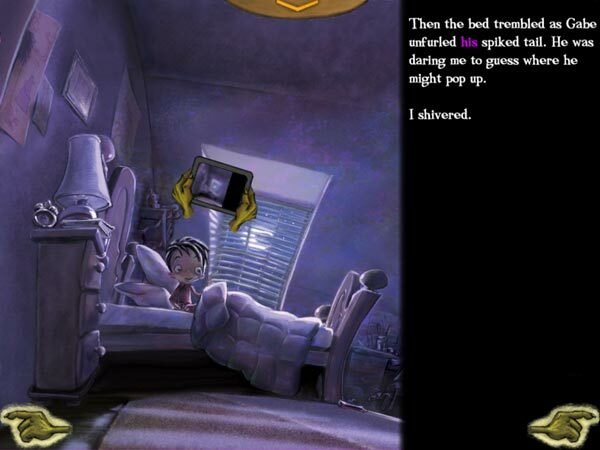 Rather than being frightened, you will delight in meeting the unique monsters that pop out from underneath the narrator's bed. Like most digital storybooks, the app is filled with interactive bits that are triggered by taps, tilts and even shakes. Even on the cover page, you can tap on the colorful letter blocks that make up the book's title to watch them wiggle and grow monstrous features. The app has two reading modes, Read to Me and Read by Myself. The Read to Me mode features an excellent narration and distinct voices for each of the story's characters, as well as word highlighting for early readers. In Read by Myself, you can tap on any of the word in a page to have the entire verse read aloud. Also included in the app are two mini games. The first is a three-level Matching Game in which you find pairs of cards with the same faces, while the second is a musical memory game featuring four goofy-looking monsters. Between the sly humor and exquisite illustrations, the app also includes interactive surprises in every page. While I was never been one to believe in monsters (I was more fearful of ghosts, no thanks to an unhealthy dose of horror stories during my childhood…), I think that I Need My Monster is an oddly fun way to extinguish bedtime fears. Its silly plot and colorful characters would appeal even to the most timid of juniors as well as grown-ups. As the center of the story, the monsters are unique characters that will win you over with their multiple limbs, goggly eyes and silly personalities. My favorite is the fourth monster, Mack, who has a ridiculously long tongue. The scene where he threatens to lick the young narrator if he gets out of bed really made me giggle. In addition to excellent character designs, the app also has wonderful illustrations that are made even more enjoyable thanks to the use of comical animations and spooky sound effects. I'm sure juniors would get a kick tapping on Gabe to see him produce green ooze that floods the narrator's bedroom or tapping on the monster drawings on the bedroom wall to hear them roar. Finally, I really like playing the mini games included in the app. They are great to play together with your juniors for winding down after a reading session. Follow Me is my personal favorite. While it is just a simple musical memory game, I find it really amusing to tap on the monsters to hear the kooky sounds they make. Also included are two mini games to entertain juniors after they finished reading. I Need My Monster is a delightfully dark story that will tingle you with excitement. Whether you are young or old, you will enjoy this sly and gorgeously illustrated book. Who knows, maybe after reading this story, you will want a monster of your own, too. Note: Thanks to the funny folks at Pony Tale for providing us with a promo code for I Need My Monster. Now we think we need monsters of our own, too!